An alleged Russian hacker has been detained in Spain at the request of American authorities, an arrest that set cyber security circles abuzz after a Russian broadcaster raised the possibility it was linked to the US presidential election. Pyotr Levashov was arrested in Barcelona on a US computer crimes warrant, a spokeswoman for Spain’s National Court said. Such arrests are not unusual — American authorities typically try to nab Russian cybercrime suspects abroad because of the difficulty involved in extraditing them from Russia — but Levashov’s arrest drew immediate attention after his wife told Russia’s RT broadcaster he was linked to America’s 2016 election hacking. RT quoted Maria Levashova as saying that armed police stormed into their apartment in Barcelona overnight, keeping her and her friend locked in a room for two hours while they quizzed Levashov. She said that when she spoke to her husband on the phone from the police station, he told her he was told that he had created a computer virus that was “linked to Trump’s election win”. 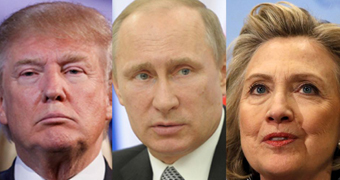 US intelligence agencies have released an unclassified version of their report concluding Vladimir Putin ordered a hidden campaign to influence America’s presidential election in favor of Donald Trump over Hillary Clinton. Levashova did not elaborate, and the exact nature of the allegations were not immediately clear. Malicious software is routinely shared, reworked and re purposed, meaning that even a computer virus’ creator may have little or nothing to do how the virus is eventually used. The US Embassy in Spain declined comment. Russian Embassy spokesman Vasily Nioradze confirmed the arrest but would not say whether he was a programmer, as reported by RT. He would not comment on the US extradition order. “As it is routine in these cases, we offer consular support to our citizen,” he said. The Spanish spokeswoman said Levashov remains in custody.